Wow. I can't believe I finished it. Not exactly how I pictured it, but, in all honesty, I didn't spend more than thirty or forty minutes on this. The whole thing is about three inches tall. The base is a bottlecap covered in felt, the cactus is basically a long green "U" shape that is stuffed, and the pink flower is just a strip of pink felt, gathered at the bottom and formed into a circle. I like that the pins look like the spines, it saved me from having to find some sort of stiff thread or wire and make each one individually. Anyway, I made it in for the Pincushion Challenge just in the nick of time. Actually, I've been feeling very cactus-like lately, and I'm sure my family thinks I've been as prickly as one. Hope this means it's out of my system, and I'll be my usual, approachable, un-irritable self again soon. So incredibly cute (and tiny)!! Wonderful job! Again, I have to tell you...you are too clever! That is so darn cute!!!! I am finally back to blogging. Hurray! Your cacti looks such a happy pin cushion! 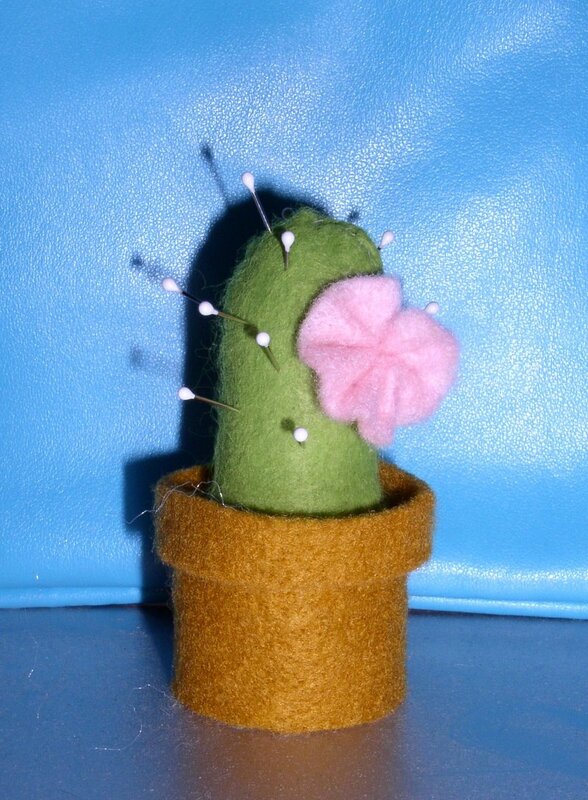 I just love this little cactus pincushion!! It's is super darling!!!!! !